After a fantastic three weeks traveling around Iran, it was finally time to turn towards home. As an American, the only way to obtain an Iranian visa had been to book a guided tour, and while the guide had been sage-like in his knowledge and helpfulness, I was looking forward to a little time on my own. 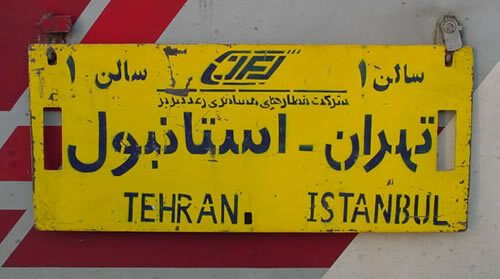 Since the visa rules require a guide only inside the country, but not on the way in or out, I’d booked the longest outbound trip I could find, the Tehran-Istanbul train. Everything started out fine. Professor [my guide] and his taxi-driving brother-in-law met me at the hotel for our short drive to Tehran’s train station. Standing inside the station, I was sad to say goodbye – Professor had become a friend during our intense three weeks together and I was going to miss him. After making sure my seat assignment and baggage were in order, and still somewhat surprised I was leaving by train instead of plane, he held out his hand and we said goodbye. Then, quickly and without another word, he disappeared out the station doors and I was suddenly alone. The train was barely half full, with only one other person in my 4-bunk compartment. My roommate for the four-day journey was to be a young Afghani who spoke no Persian and whose only English was ‘ok’. Since that was more Afghani than I speak, we went with his English and a lot of miming. He was going to Istanbul to work and seemed spellbound by my maps of Iran and Turkey. Other than that he turned out to be a very quiet guy – perfect for a long train ride.